The "Spring is Here" banner is from Joann Fabric from this year. I bought some small, colored clothespins at Michael's to attach the letters to bakers twine (that came with the banner). I find clipping items like this is easier than stringing them. I keep two small eye hooks on the mantel at all times to attach banners, buntings, stockings. This makes it easy for me to change things out quickly. The green glass vase is from Hobby Lobby. I've had this one for a while, but I assume they always sell this kind of glass. 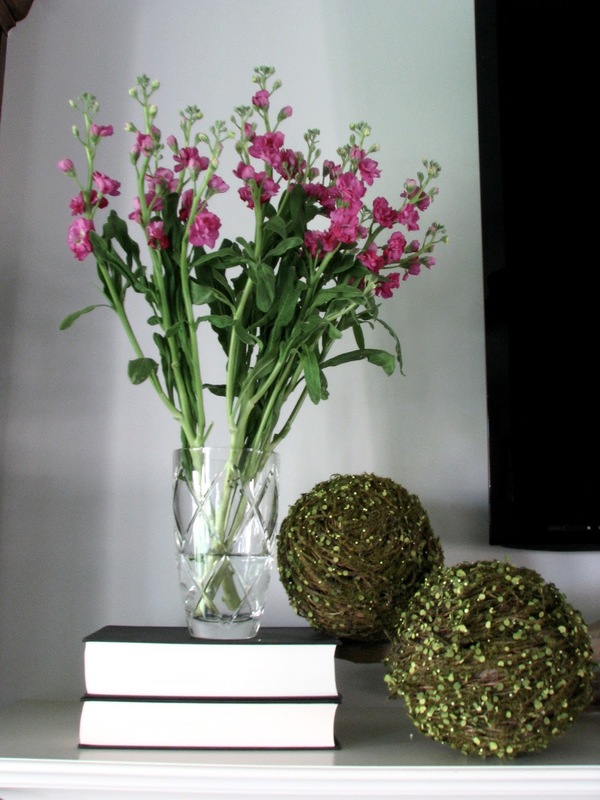 The smaller glass vase is from Homegoods. I rotate these glass vases all over the house. These are easy and inexpensive items to use in your home all year long. I recently found this log holder at my mom's Homegoods in Des Moines on clearance. I like the openness of it and it allows the birch logs to really be seen. I scored the logs from my sister and BIL's house. They had a huge bundle delivered to their home because they have a gorgeous, wood burning fireplace. Ours is a flip-the-switch kind, but I still love the look of logs by a fireplace! The pink flowers are real from Trader Joe's, but the moss sticks are faux and purchased about five years ago at Hobby Lobby. Faux flowers/stems have a come a really long way and I'm not afraid to use them in small doses. These are large and dramatic and inexpensive (be sure to catch their florals when it's a 50% off week). The glass vase is also from Homegoods, it's just a different size. The moss balls are a thrift store find from several years ago, and I made that small moss wreath several years ago as well. These are all items from the basement that said "spring" to me when I was shopping my own stuff. The pink ceramic ball is also from Homegoods (can you see a theme here)? I love to use books for height variation. If you don't have a book spine that is the color you want, simply turn them around so the pages are showing. White pages always work! The large pieces of driftwood are from a park/lake near our home. I found them several years ago and bleached them in the sun. 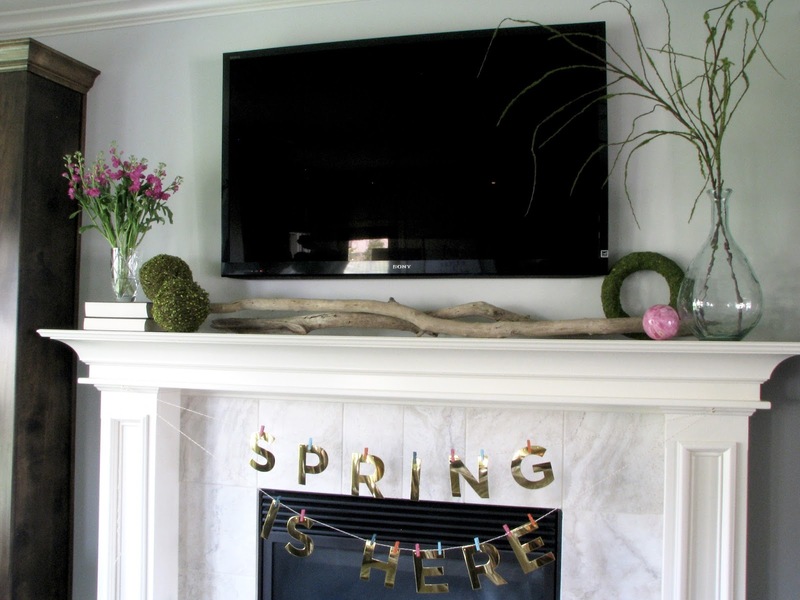 When not decorated for a season, these pieces of driftwood are the only things on the mantel. 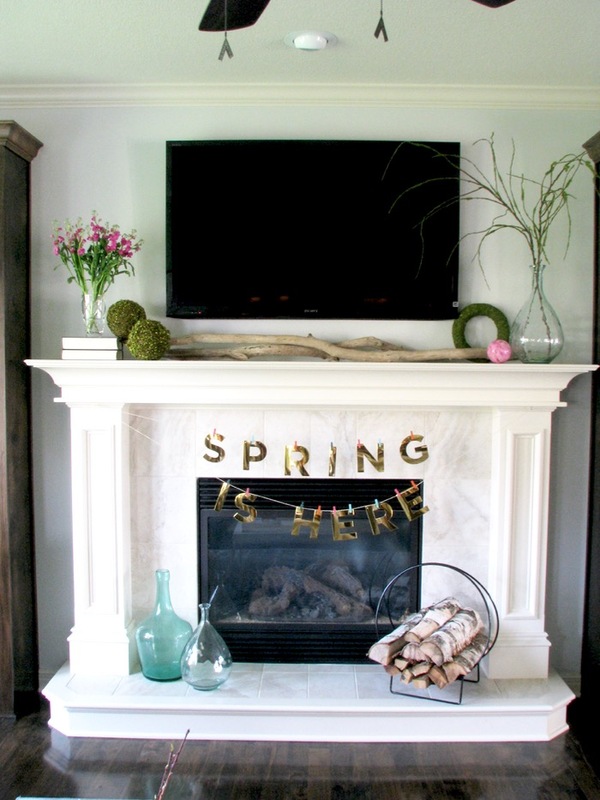 I just love the natural look of them and they work all year long with any style of decor. And the TV? Well, it is what it is and it's not going anywhere, so I have to decorate around it! Wall color is Sherwin Williams Big Chill and fireplace trim/mantel is Sherwin Williams Alabaster.